A LITTLE bit of Chile has arrived close to Clonalvy, near Naul, thanks to Terry Gill who is running an alpaca farm and has the South America animals grazing in a number of fields around the small village. A business graduate, who has a full-time office job, he decided to diversify into alpacas which resemble a small llama, about two years ago. He now has 50 alpacas, 35 breeding females, eight stud males and is ' expecting' 20 babies later this summer. This means he has the third biggest herd in the Republic which now has a total alpaca population of around 1,000 animals. Originally from Clondalkin, Terry doesn't come from a farming background. But during six months spent researching potential business opportunities during which he considered camper-vans or website design, he 'stumbled across' alpacas and was sold on the idea. With a breeding female costing €3,000 alone, it has taken €40,000 to get Terry's business up and running. 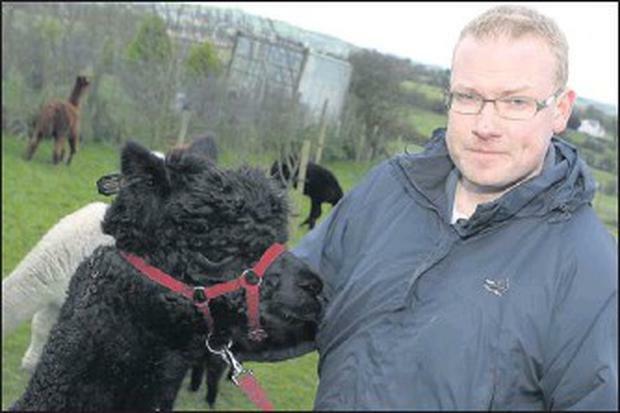 His bank wouldn't entertain the idea of giving him even an overdraft to become an alpaca farmer, so he went to Ashbourne Credit Union who have helped with funding for the project. Two years on, the 37-year-old is hoping to make a profit within the next two years from selling the high-quality baby soft wool to spinners who make baby boots and other items like scarves and also to farmers. The animals which eat a similar diet to sheep, can't be sold for slaughter and their meat is unlicensed in Ireland. The gentle creatures seem to thrive in Ireland's mild climate which must seem warm compared to the Andes where the temperature can drop to minus 20c, according to Terry. With over 50 alpacas grazing on just over ten acres in the village of Clonalvy, they are a regular, although still 'intriguing and interesting' sight for locals including the primary school pupils who can see them from their classrooms. 'I am sure some of the farmers think I am mad but I do love looking after them,' says Terry, who is hoping to go to South America and see the alpacas who are native to Chile Peru and Boliva in their natural habitat. ' The only thing is they need looking after everyday so it may have to wait a while,' he says.